Feel Secure with our Three Year / 36,000 Mile Nationwide Warranty! Ervine’s Auto Repair and Grand Rapids Hybrid offer an unmatched 36,000 mile / 36 month warranty on all premium parts. Including free roadside assistance. We are that confident in our work! Contact us for full warranty details. We are proud to say we are one of a handful of independent garages in the greater Grand Rapids area to be recognized as an ASE Blue Seal of Excellence Facility. Complimentary loaner vehicles available for your convenience. 1. 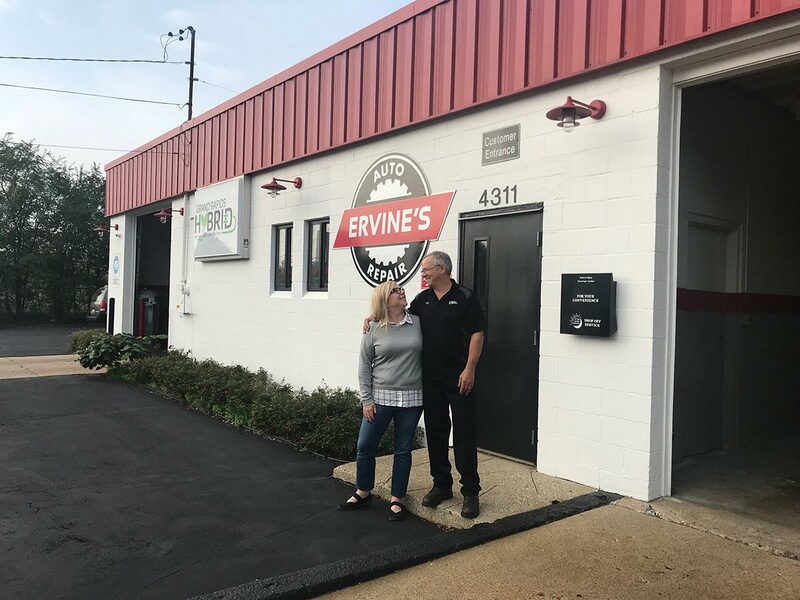 For Jamie and Eric Carlson, the owners of Ervine’s Auto Repair & Grand Rapids Hybrid, their passion has always been auto repair and helping people. Eric excels at all things mechanical, while Jamie loves helping people. That’s what they both did for years before joining forces professionally. Because they basically live and breathe auto repair, their auto repair shop’s environment is infused with passion and perseverance. 2. We are the masters of ASE-Certification, literally. All the auto mechanics at Ervine’s Auto Repair & Grand Rapids Hybrid are ASE-Certified. Most are Master Technicians and Advanced Level Specialists in Engine Performance L1 tech. The tests are challenging. Only two out of every three test-takers pass on their first attempt. To remain ASE-Certified, professionals must retest every five years to keep up with ever-advancing automotive technology. For Eric Carlson, this meant pursuing hybrid training and obtaining an L3 Hybrid certification. Then he served by helping write the ASE hybrid test! Our shop is also an ASE Blue Seal of Excellence Facility. If you are looking for an auto repair shop with top-of-the-line skills and training, you are in the right place. 3. Have some place to be in Grand Rapids or the surrounding regions while our technicians service your vehicle? We have six loaner cars available. If you would prefer to relax in our waiting room, you can enjoy a cup of hot Starbucks coffee while we get right to work. We also have key lockboxes if you need to pick your vehicle up after work. Just let us know how we can make your experience with us positive and stress-free, and we will try our best to make it happen. 4. We are confident in the quality and reliability of our auto repair and we stand behind everything we do with our 3-year/36,000 mile NationWide Warranty, this gives you peace of mind, knowing your car was well taken care of. 5. As a testament to the service we offer at Ervine’s Auto Repair & Grand Rapids Hybrid, we have maintained and serviced a fleet for 15 years and counting. As of this writing, not one of those cars has ever broken down! :-) Our clients, including this fleet customer, trust us, and we think after a visit to our auto repair shop, you will too. The partnership between Ervine’s and its customers, along with routine maintenance, such as oil changes, allows us to catch small problems before they have a chance to grow large enough to threaten your comfort, safety and /or wallet. When you arrive at Ervine’s Auto Repair & Grand Rapids Hybrid, located in Grand Rapids, you will quickly see how much we care for you, your vehicle, and the rest of our team at our facility. We take responsibility for you and your vehicle, so we will do our best to keep you on the roads of Grand Rapids for the long term. Schedule an appointment today. We are located at 4311 Stafford SW, Grand Rapids, Michigan 49548 and are open Monday - Friday, 8:00 AM - 5:00 PM. the first and only Qualified Independent Hybrid Repair Facility in Grand Rapids. If you’re driving a hybrid or electric vehicle in Grand Rapids, Michigan you’ve most likely made a thoughtful, conscious decision to do so. Grand Rapids Hybrid, a division of Ervine’s Auto Repair is the first and only qualified independent hybrid repair facility in Grand Rapids. We are equipped to maintain and service Toyota, Ford and Honda Hybrid vehicles as well as Chevy Volt and Nissan Leaf electric vehicles. The partnership between Ervine’s and its customers, along with routine maintenance allows us to catch small problems before they have a chance to grow large enough to threaten your comfort, safety and /or wallet. Should you encounter problems large or small you can rely on Ervine’s, an ASE Blue Seal of Excellence Facility and our skilled ASE Certified Master Technicians to take care of your vehicle in a timely and professional manner.